When we bought our house I would of loved for the siding to be a different color but why change it out. It was practically brand spanking new and who cares if it is a light shade of yellow. Well, I do. I have been struggling with the front door going with this um… yellow shade for years now. I thought red was the it factor when all along it looked like McDonalds. Speaking of Mc.Donalds did you know they stopped making the chicken selects. Shame on you Micky D. You have disappointed many hungry kids whose parents are too busy to cook a real meal, hehe. Finally Martha Stewart sent me some black paint, called Francesa. That is the name of her dog. It took me a while before I could paint something. How could it be so hard to find SOMETHING to paint black. One day I was picking the weeds that I barely get too anymore then all of a sudden this magical beam of something was shining down on the front door. I think it was just the sun coming up but we are gonna pretend it was a “sign”. Let’s check out what I did. We can begin with the picture above. Before we talk about the lovely color we will dissect it a little bit. 1. Yes. The red is a pretty red, just not after 8 years. At least it wasn’t this color. 2. I know, I know my flowers in the pot are a HOT mess. I swear at one point last year they were blooming beautifully with green plants. Maybe I should of watered them with this. 3. On the flip side, I see something living in the bottom right corner, SCORE. 4. Before you get on me I know the trim looks like I pressure washed it to prepare for a new coat of paint when I really didn’t. This is just years and years of not getting TLC. 5. I still have that otter box case but I never keep it on my phone. Way too bulky. 6. Last but not least we will talk about the abandoned wreath up there. I swear I usually have cute things hanging on my ugly door so I really don’t recall putting this up. All we are really looking at is how the door looks with this color on it. We will now procede on to the picture below. Yes. Everything is practically the same but the wreath is down. I will make your heart happy by telling you it never made it back on the door. 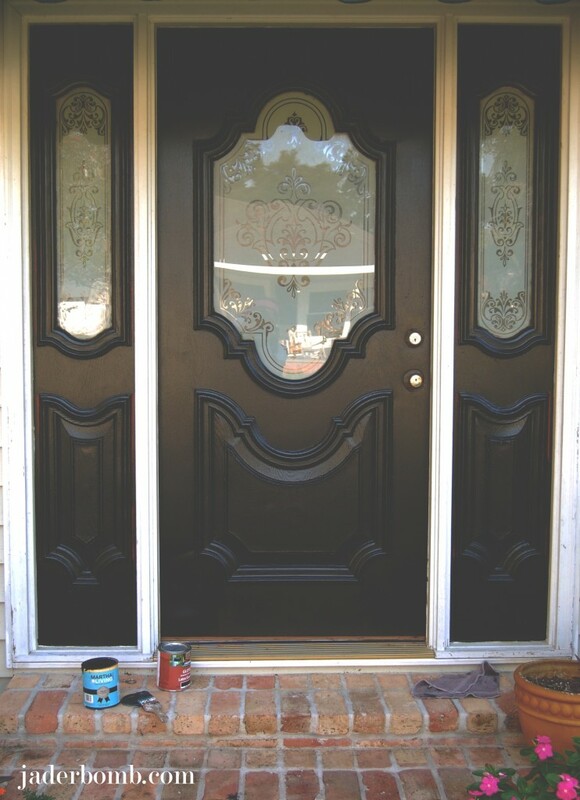 I am just trying to show you that a fresh coat of black paint can change your door’s life. It’s like it had a face lift, minus the trim getting done. So the point is you don’t have to change your siding all you have to do is paint your door. If you have shutters get them babies done too. I hope I gave you some inspiration! 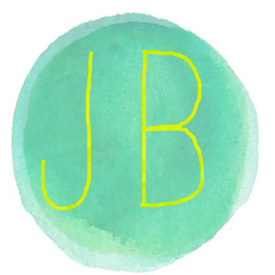 See you in the next post Jaderbugs. *I will be blogging for I Love to Create. YAY. *Have you checked out my NEW site yet? Click HERE to get to it. What a vast improvement! I really like the black door. And it only took you 30 minutes? 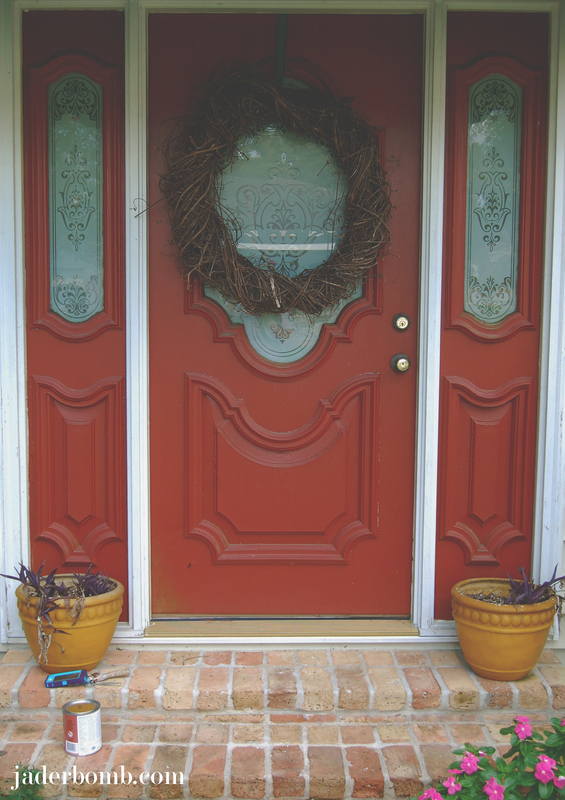 I did our 2 front doors a couple years ago, it took me all day. They needed a few coats to cover properly. I’d love to know your secret for when I do them again! Debbie: I am a really fast painte! HAHA Thanks for the comment! Laura: It’s crazy how much it can change your home! I’m just getting ready to give my front door a much needed make over. I am curious about what kind of paint you used, and what kind provides the best coverage for a wooden door that sees a lot of southern exposure sunlight. 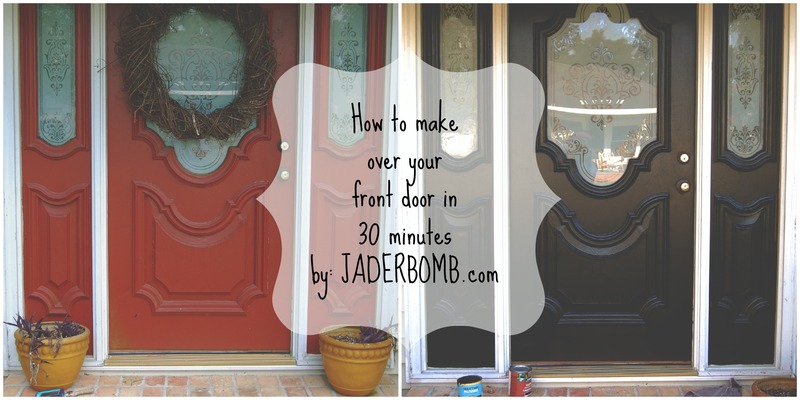 I’ve heard of people using car paint on front doors… this intrigues me. I do want a glossy, lasting finish…but not sure I am prepared to take it to the automotive level. Thoughts? Also Curious. We have a lab that will occasionally open the door herself, we have the flip down handles. Is there a paint that would be sturdier so as not to scratch up when she does this. Or what would you recommend?